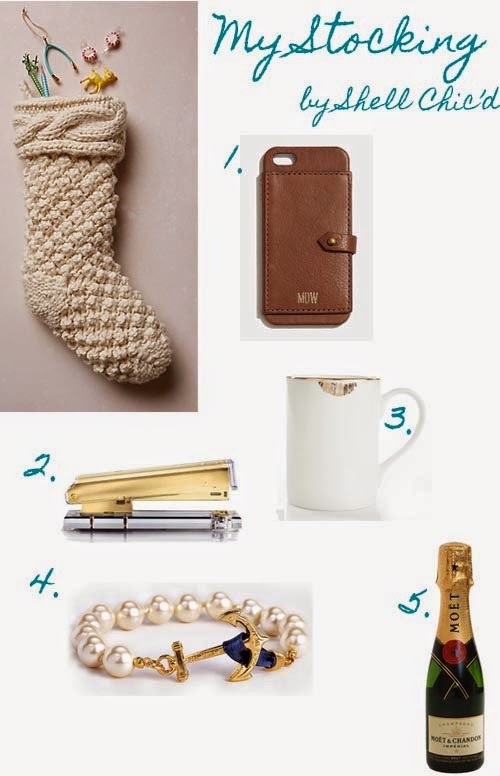 Thanks to Boston blogger, Emily, of Shell Chic'd, for sharing her stocking today! 1. Leather Wallet Case for iPhone, Madewell: If I can't upgrade to the iPhone 6 for another six months, might as well deck out the current iPhone 5! Love this case/wallet with the added bonus of a sweet monogram. 2. Acrylic Stapler, Kate Spade: I usually find some semblance of school (now office!) supplies in my stocking, so might as well get fancy with it! 3. Lipstick Stained Mug, SHOP by Monika: Nothing gets me out of bed like coffee in a cute mug. 5. Mini Moet & Chandon Champagne: 'Tis the season for bubbly! Love the little iPhone wallet!